Nails Inc’s Bling it on Denim & Studs isn’t really something I would usually buy myself but I won this little set in a competition over on lookfantastic.com. Although part of the Bling it on set the nail varnish is named (Bermondsey) but I don’t believe that this is available separately (I may be wrong but I couldn’t find it on the website). 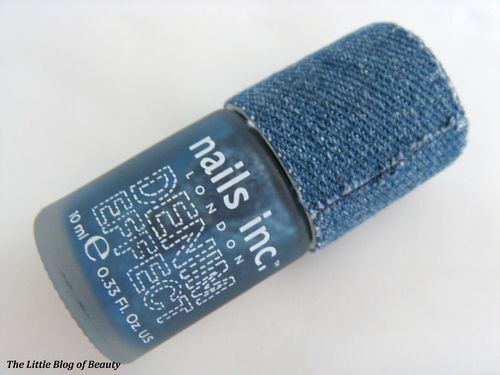 The lid of the nail varnish is actually covered in old denim, which obviously fits the theme of the set, but I’m not personally keen on this because I don’t like the feel of the denim! Call me strange but I have this thing where if my fingers have been in water for a while I then can’t touch fabric because the feel of it goes right through me (I can’t be the only one, surely?). You begin by applying a coat of base coat and then two coats of Bermondsey (I personally think you could easily get away with one coat). When you first apply this it goes on as a shimmery dark navy blue that would look amazing if it dried glossy like a normal varnish. The denim effect then appears as this dries. I wasn’t sure what to expect from the denim effect but once this dried I found it was basically exactly the same as liquid sand by OPI. Although this does kind of look like denim it doesn’t feel like denim at all because the liquid sand texture makes it rough. I’m not a fan of blue nail varnish, in fact I would say I hate most blue nail varnishes, but I do actually really like the colour of this. I don’t think it’s really a summer colour though as it’s very dark. To apply the ‘studs’ the instructions tell you to use a piece of card that’s included in the pack and to squeeze a small amount of nail glue onto one corner and apply a small amount of top coat to the other corner. 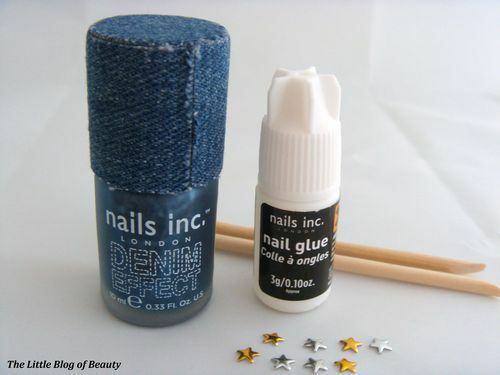 You dip the cuticle stick into the glue and apply a small amount on your nail where you want your stud. 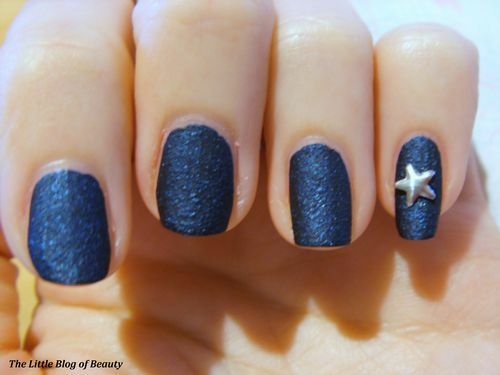 You then dip the cuticle stick into the top coat and use this to pick up a star and place on your nail before holding down for a few seconds to secure. This sounds quite simple, but it’s actually pretty tricky! To begin with, as is usual for me when using any kind of glue, I glued my fingers together! But obviously nail glue isn’t as bad as superglue (I’ve never had to actually make and A&E trip fortunately, but just don’t give me superglue!). 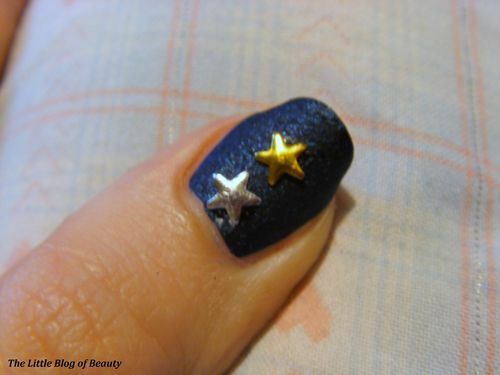 Using the top coat to pick up the stars I found that the top coat then dried on top of the star and ruined the shiny effect. I also found that either some of the glue or some of the top coat dried white on top of the name varnish (you can see this on the thumb nail picture) which kind of ruined the effect. I have just done this before writing this post and I took a quick break a few paragraphs back to go to the bathroom. I got back and the star from my little finger has already gone missing! Admittedly my finger nails are very curved, especially my little finger nails, so it probably didn’t have good contact with my nail. As this is a liquid sand type texture you can’t use a top coat over the top because this will ruin the effect. Unfortunately this means this nail varnish really does not have any staying power. Within a couple of hours a large chunk had gone missing from the middle part of my thumb nail, not even near the edge. Through the next day large parts of this chipped off so by the time I’d had this on for 24 hours it was a mess. I think I would possibly use the nail varnish again in the winter but I’m not sure I would use the ‘studs’ and would probably only apply it if I was going out somewhere as it just doesn’t last. 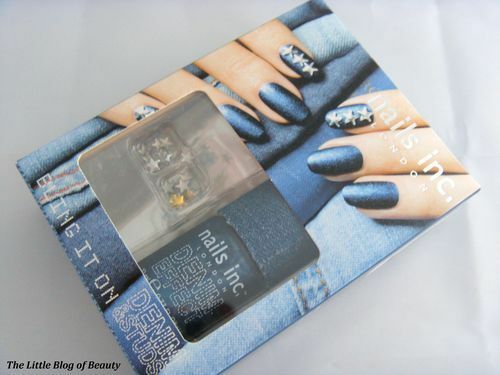 You can get Nails Inc Bling it on Denim & Studs from the Nails Inc website for £19.